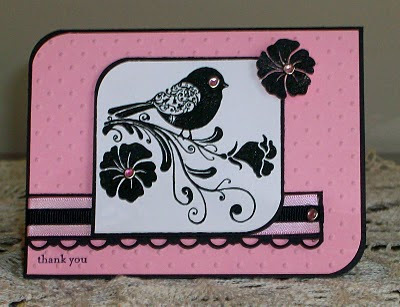 I did this card for this weeks' Stamping 411 Saturday sketch challenge. I really liked the sketch, but found that the rounded corners gave me a deco feel that I couldn't seem to do justice to. Out of respect for that deco feel, I did the card in a monocromatic palette of Pretty in Pink and Black. The central image was stamped in Versamark, then embossed with black detail ep. The birds' eye and the flower centers are pink rhinestone brads. Wow, really pretty. Love the pink & black combo. Very striking. I love this card and the color combo. Wonderful! !